Granite Samples are Great for Shopping. So, you’re getting new granite counters. You take a few little granite samples home. You put the samples on your cabinets and pick one. Well, maybe. It sounds perfect until your counters are installed and they look nothing like the little sample you selected. Do all of the above, and THEN: go to a granite yard and pick your actual material. You know, the stuff we’re going to cut up into countertops for your home or business. That way you know for sure that the granite that gets installed is exactly what you picked, and not something that has one little corner that looks like the sample and a whole lot of other areas that look totally different. Oooh, terrible, right? Stone yards buy granite in bundles of 6 or 7 slabs. The slabs in a bundle are supposed to be the same, or to match each other really well. The same is NOT true from bundle to bundle. The slabs in one bundle might be close, or really close, in color and pattern to another bundle (especially if they were bought at the same time). Or, they might be pretty different. Read the article about Santa Cecilia: It Ain’t All the Same for an idea of what we mean. Although that article shows that Santa Cecilia comes in a lot of different styles, they also vary in color and pattern within a grouping. So, if you want to be certain that your new kitchen counters are what you really want, you need to go and put your hand on the actual stone in the stone yard and have them label it for you. (Read Austin Granite Yards: What to Expect). We’re a granite fabricator. That means we can buy stone from any of the reputable granite yards in Austin and make it in to your granite counters or tabletop. 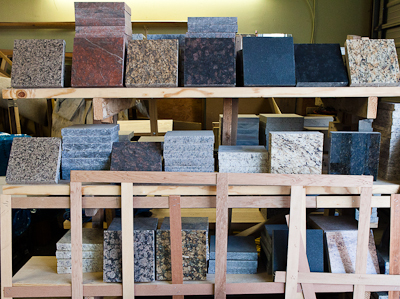 We don’t stock stone at our shop (except for remnants for small jobs like bathroom vanities). We DO have granite samples from past jobs. You can come and borrow some, to do your early research. The samples will help you make some decisions such as: light or dark? Big and bold pattern, or small and tight pattern? Ivories and golds, or blacks and greys? Our samples are MUCH bigger than most of the itty bitty samples you can get at the big box stores. Throw that junk away and come visit us. Take a few minutes to read some of the other articles in the Getting Ready for Granite Series to make getting your new granite counters even easier and less confusing.